I feel like I have been all over the place over the past few weeks, mainly due to the fact that I have changed jobs, flat, and that getting used to my new routine is taking me longer than I thought it would. Affecting my sleep for instance (click this link for my tips for a good night sleep). This means that I didn’t have as much time to spend in the kitchen, doing my favourite thing in the world, i.e. creating new recipes. Why are antioxidants essential to our bodies ? A diet rich in antioxidants protects us from free radicals. Free radicals are molecules that are deprived of an electron, which they will take away from another molecule making it weaker. Hence, our body ageing more rapidly. Antioxidants come to the rescue by providing free radicals with the electron needed. As a result a diet rich in antioxidants (Vit A, C, E, Zinc, bioflavonoids, etc.) is of upmost importance! Antioxidants reduce inflammation in our body. 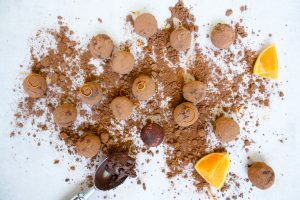 The higher the % of cacao your favourite chocolate contains the more antioxidants (flavonoids & polyphenols) you will find. Among its numerous benefits, the consumption of dark chocolate is also linked to a healthy heart and better cognitive functions. So don’t be shy and help yourself to a square of dark chocolate! One of the reason why dark chocolate is higher in antioxidants compared to white chocolate is due to the presence of milk in the latter. The milk protein casein makes the flavonoids in chocolate inactive. For instance, black tea is full of antioxidants but when consumed with milk research shows that the effect on our body becomes null. Instead treat yourself to a piece of dark chocolate with a cup of green tea. Both contain high cancer fighting properties. 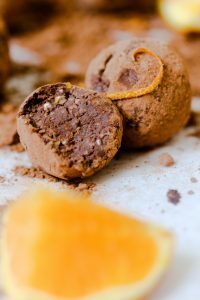 A delicious treat that requires very little of your time and that is easy to make. Chop the dark chocolate into small pieces and place in a large bowl. In your food processor, pulse the oats until they are finely ground. Put the coconut milk into a saucepan on a medium heat. Do not let it boil and stop just before it reaches boiling point. Pour the coconut milk over the dark chocolate and whisk until the chocolate has melted. Add the orange zests and salt (if used). Wait until the chocolate cools a little, then add to the food processor with the oats. Leave the bowl in the fridge for 2 hours. 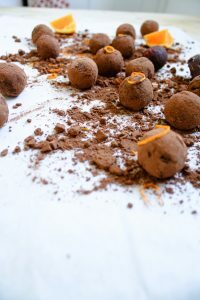 Next, roll the mixture into small balls and dust with cocoa powder. Best kept in the fridge. 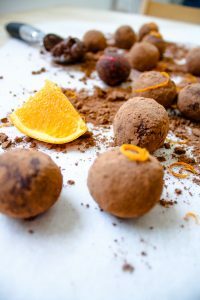 I hope you try and like this 5 ingredients Dark Chocolate Truffles with Orange Zest Recipe, if so let me know! Share on Pinterest and tag a photo on Instagram #mimies_delicacies so that I can see your lovely creations as well as helping me reach more of you lovely people. Merci my friends!